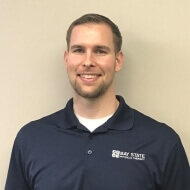 Ryan received his Bachelors of Science degree in Kinesiology from the University of Massachusetts Amherst in 2012 and then furthered his education at the University of Massachusetts Lowell, earning his Doctorate degree in Physical Therapy. He specializes in treating general orthopedic conditions that effect both the spine and extremities with a focus in sports medicine. He utilizes a specific combination of manual hands on techniques, therapeutic exercises and modalities to not only restore patients back to their normal functioning but put them in a position to prevent future injuries. Ryan grew up playing a number of different sports including baseball, basketball and football and most recently has picked up tennis and golf. In his spare time he enjoys having fun with family and friends, exercising and cooking.